We had booked a tour to Magdalena Island with Solo Expediciones *months* prior to our cruise. Three (3) days prior to arriving in Punta Arenas, our group [~ 35 people], received an email cancelling our reservation due to *mechanical issues* with their boat. When we all reserved, Solo offered a “land trip” if they could not sail to the Island. When we inquired about the alternative, that option was no longer available. We went to their office on the day of to again ask if we could have an alternate tour and again, they responded, “no”. Our suspicious spidey senses went off that we were dumped for a larger, higher paying customer. We found out the day of, when we were in the city centre searching for something to do that Solo *did* sail out that day to Magdalena Island and we were in fact, dumped for better paying customer. We would *not* under any circumstance recommend this company to anyone visiting Punta Arenas. Very poor customer service and very poor business practice. We were on the first tender to Punta Arenas which gave us much needed time to find an alternative to our pre-planned trip with Solo. After a visit to the Solo Office and another failed attempt with them, we split up and began trying to find an alternative excursion for the day. After about an hour of searching, we went to the “Tourist Info” booth located at the central park in Punta Arenas, near the statue of Ferdinand Magellan. The attendant spoke excellent English and was extremely helpful. 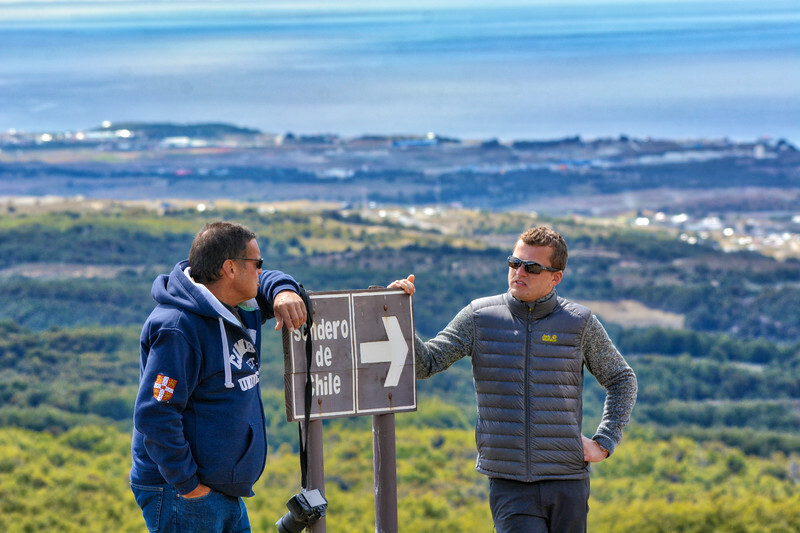 Based on the information he provided, our now small entourage of 4 people took a Taxi for $10 USD ($2.50 pp) and within 10 minutes arrived at the “Reserva Nacional Magallanes” (National Forest) that offered excellent hiking opportunities and beautiful views. The same excursion is offered from Celebrity – but for around $70 USD (4-hour tour). The cost to enter the park is $4500 chilean pesos (~ $7.50 USD) per person. This was payable in cash and one person in the group needs to register their information with the Ranger as a person responsible for the group. 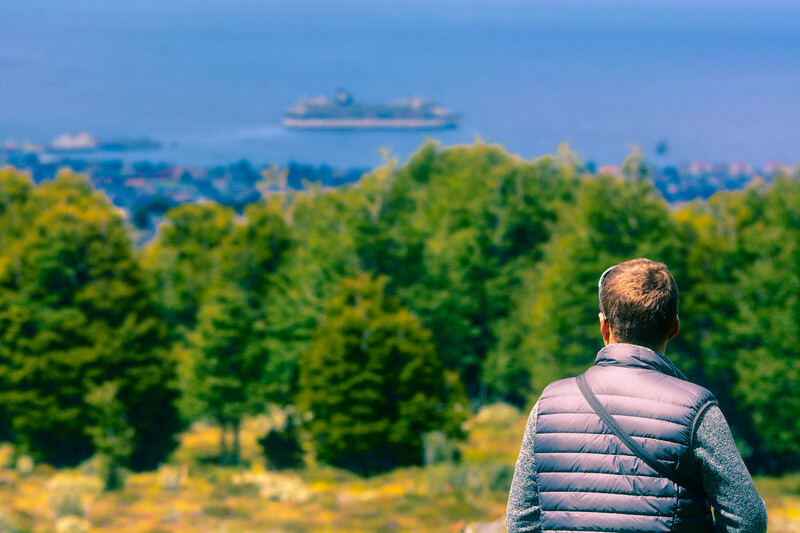 The administration office Ranger suggested to take the “Mirador Zapador Austral” trail (~2.5 Km to the viewing platform) which offered panoramic views of Punta Arenas and the bay. IF we arrived earlier – we would have had time to do an extended hike – but turns out the path we chose was excellent and we enjoyed it very much. Not a trail for those with mobility issues, as some inclines were challenging – but if you have a moderate fitness level, this trail is very good! the park also offered shorter, less challenging trails – if need be. We really took our time walking to the Mirador and let the larger groups pass us by. We were very thankful that we did this, as when we finally arrived at the Mirador, it was only the four of us – with the entire viewing platform to ourselves. Truly magnificent!!! The time we took also allowed us to take in the sights & sounds of the Patagonian forest, and beautiful birds along the way. 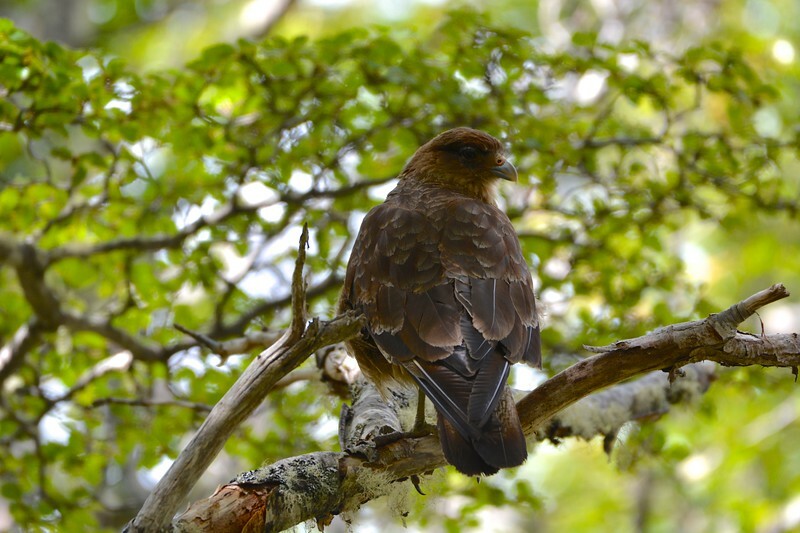 We had a lot of fun trying to seek out the deep forest birds that lurked in the tall canopy and also were thrilled when a Chilean Hawk flew right across our path and landed a few metres from where we were standing. When we finished our hike, returning to the Administration Office, the Ranger kindly phoned a Taxi to pick us up. We thought she was calling our original driver, but it was a straight forward cab call and another driver showed up within 15 minutes to take us back to the port directly. He was slightly less expensive ($8 USD, or $2 pp) and again only a 10 minute drive. 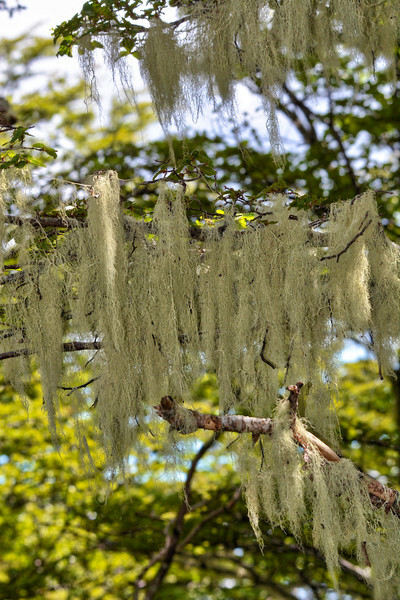 We certainly made sweet lemonade out of the lemons that Solo gave to us in Punta Arenas and we are very thankful to the Tourist Info booth near the park for the excellent recommendation to visit the National Forest. 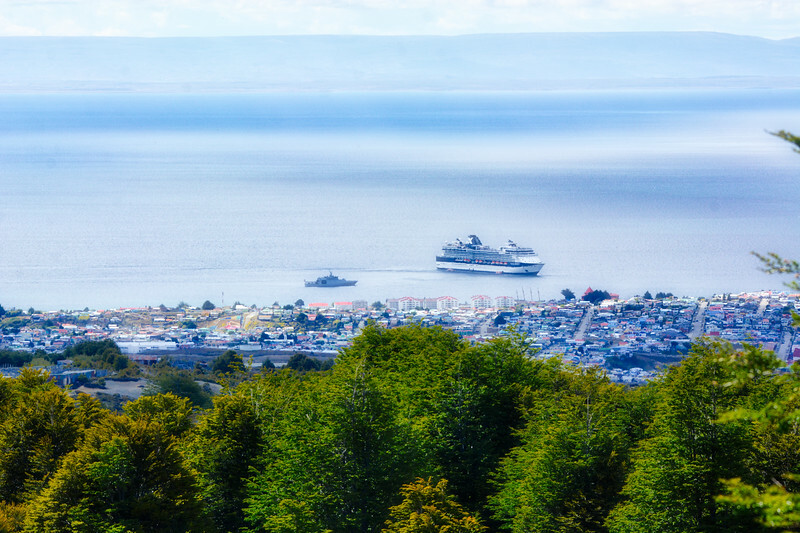 As we sailed away from Punta Arenas, Anthony & I again sat on our beloved balcony and watched the scenery as we sailed by. 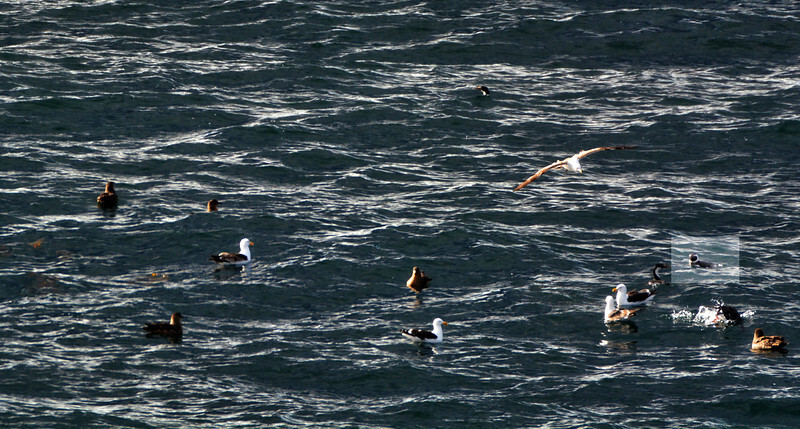 There were birds resting on the waters, so I grabbed a few pics – lo & behold, it seems that we *did* see a penguin after all in Punta Arenas. Thank you Mr. Penguin for the appearance! (highlighted square below). As we left Punta Arenas and travelled through the inland waters of the Strait of Magellan, we were treated to more spectacular scenery. 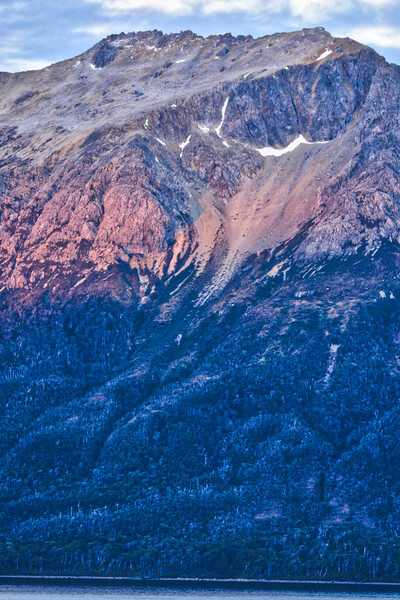 Our cabin steward asked us the next morning if we captured any of the “fire and ice” show – he aptly described the setting sun’s red rays against the snow-capped peaks! After a wee rest after our long day, I headed to the Persian Gardens where I rested my now tired body on the heated ceramic benches and also indulged in a Lavender / Eucalyptus infused steam room. It was a nice treat after two solid days of hiking!